After yesterday’s post on flying cows and red cows, my cow sightings for today will look like they popped out right out of the ordinary. Hey, it’s not every day I run into cows with hair as long as mine, so it’s hard to top that off. I ran into cows twice today while at my local Food4Less grocery store. The first one was on the wall above the meat department. This is another clear example that cows and pigs indeed are best friends and like to hang out together, even when they’re about to be chosen as dinner meat. Maybe it’s their way to show each other support when times are tough. Even the package, with its cow hide pattern, sends you subliminal vibes to grab it off the shelf. 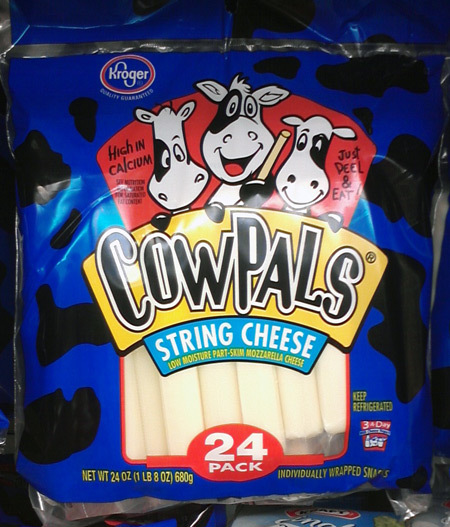 The last string cheese package I ran into at Vons also featured funny-looking cows doing cartwheels in a field. Apparently string cheese makes you do amazing things. I’ve seen the results on my kids and I’m quite impressed. It makes them hop like rabbits all over the place – that’s strong stuff. Maybe I should try it for myself, so I can keep up with them! Previous Post What do cows look like in the Friskies cat food commercial Adventureland? Next Post More cows on NBC’s The Office!